A simple mount used for positioning technology on tables and desks. 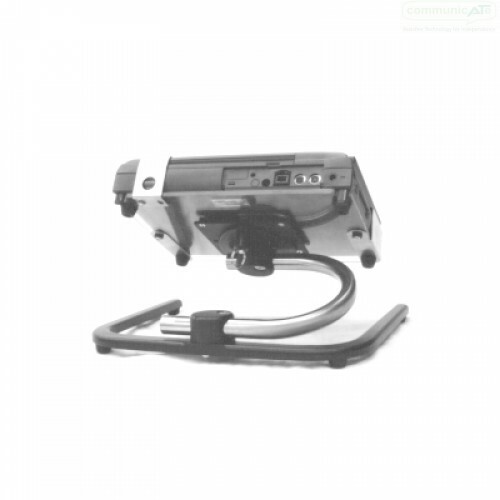 The Desk Mount is most commonly used in conjunction with one of the DAESSY wheelchair Mounts. The Desk Mountg allows a device to be positioned on a desk or table at precisely the same orientation as it is on the wheelchair. Consisting of a base, a U-shaped tube and a DAESSY Quick Release Base, the mount can be adjusted easily and is compatible with all DAESSY device adapter plates. With large devices it is important to ensure the device is within the base area of the Desk Mount to reduce any tendency to tip. Although the Mount has small rubbersied feet, the Desk Mount may still slide about some surfaces when the device or touch screen is directly accessed with some force. Ensuring the mount is stabel under these conditions is an important consideration.